The sixth annual Crowchild Classic took place on Jan. 25 at the Scotiabank Saddledome, where both the Cougar hockey teams suffered tough defeats at the hands of crosstown rivals, the University of Calgary Dinos. The women’s team dropped a defensive 1-0 game while the men, experiencing déjà vu, dropped a double-overtime loss for the third straight year with a 6-5 game in this year’s edition. Heading into the day, the women’s Cougar hockey team were coming off getting swept at the hands of top-ranked Manitoba Bisons, having their historic five-game win streak and hot start to 2018 be snapped with defeats of 1-0 and 2-0. MRU looking to bounce back, squared off against the Dinos in front of 2,500 in attendance for the first game at the ‘Dome in the early afternoon. The Cougars suffered a rough loss. Shots were 27-12 in favour of the Cougars but not one got past red-hot Dino goaltender Kelsey Roberts who picked up her sixth shutout of the season, making key highlight reel saves all game long. The Cougars dominated play but just didn’t have the puck bounce their way. “We stuck with our forecheck, we had shots on net but with not as much traffic needed to beat a goalie like that,” fifth-year Rachel Pitz commented after the game. Calgary’s only marker came around the halfway point of the second period where they stuck to their theme of tossing low pucks on the net where one of 12 shots got past Cougar goalie Zoe De Beauville, who got fooled by a deflected point shot. The rest of the game played out to be a chess match where the Dinos held on for the win and a big three points. MRU was only a point ahead of Calgary in the Canada West standings heading into the rematch and to their fortune, returned the favour with their own 1-0 win the following night and had the trailing Regina Cougars get swept by Manitoba. The women’s Cougar squad have a tough schedule to end the year on. Travelling to B.C. and playing the third ranked, the UBC Thunderbirds. Then, travelling to the prairies and visiting Saskatchewan, who have double the wins MRU has. The men had a huge task ahead of them, being pit against a hungry inner-city rival looking to make the playoffs after forfeiting six games, breaking Canada West policy of playing with an eligible player. The boys in blue clawed back after being down 2-0 early in the first period and scored three goals in a row. 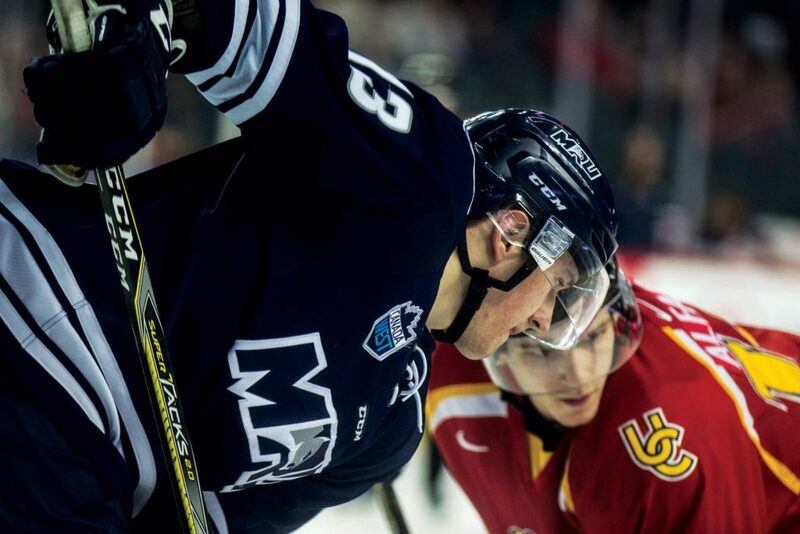 Calgary then scored two of their own in a row and forced MRU to comeback and then take the lead with only 2:06 left, before the Dinos tied the game at 5-5 27 seconds later. After Cougar keeper Cam Lanigan stopped three dangerous chances in the first overtime out of 23 total, the game went into double-overtime for the third straight year. The Cougars were edged 29 seconds into the 3 v.s 3 session to cap off an insane night in front of 10,478 fans in the ‘Dome. Cougar captain Jamie King played his heart out that night, scoring two goals in his final Classic while also coming back from a wrist injury that sidelined him since the opening weekend of 2018. “It was bittersweet, I told the guys I was sad this is the last time I can experience this with them but at the same time it was exciting. I was glad I got the chance to experience this one last time.” he says. “It was cool, the ups and down of the game is pretty crazy, when we scored the last goal the emotions were running high running on adrenaline there, it plays a big role and everything becomes that much more important when the school and the team is rallying around you.” King commented on the effect the crowd had on the players. Seven rookies played in the Classic for the first time. Hunter Zandee stood out from the pack collecting three points with a goal. “It was a group collection to prepare for this… there’s nothing you can really say to show how cool it is to experience a stadium full of students screaming their heads off, they handled it well though and I was proud of them.” says King. MRU looked for revenge the next night but to their dismay, were swept by the Dinos dropping a 4-2 game away from home. “Pissed off,” King says about the team’s attitude heading into the rematch. Also to the Cougars’ dismay, UBC swept second-placed Saskatchewan and clinched a playoff berth to create more distance between them and MRU for third place in the Canada West conference. UBC and MRU are set to play two games in Calgary this weekend where the Cougars will look to clip a high-flying Thunderbirds squad who are on a six-game win streak. In the previous meeting of these two schools, the Cougars swept the ‘Birds earlier this year.